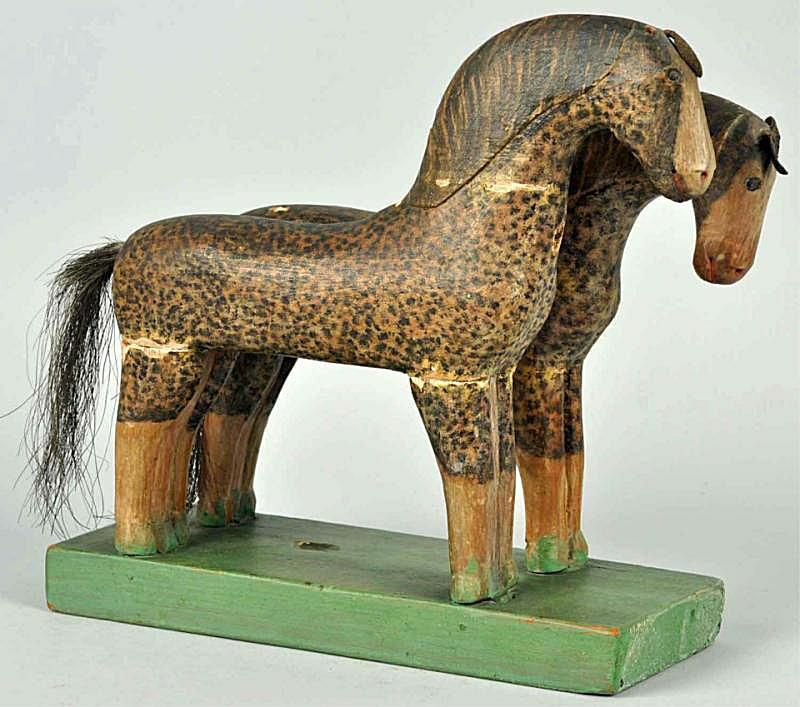 From decorative accessories to toys, folk art takes many shapes and forms. These antiques and collectibles were generally handmade by untrained artists in the classical sense, although techniques like whittling or carving used may have been passed on from generation to generation. Many times the origin is unknown, but these pieces tend to reflect the culture of the region where they were produced. This is one area of collecting where beauty and craftsmanship are subjective, and values can vary widely. Carved wooden horses by Peter Brubaker (1816 - 1898). Sold with letter providing provenance that the horses have been in the Ebling family for five generations. Minor age chips and cracks otherwise excellent. Note: Selling price does not include buyer's premium. Unsigned carved wooden folk art tree with 12 birds all intact but cat at bottom is missing one of his ears. Condition: excellent overall. Size 20" tall. Doll head and torso made from wooden brush. Hand-painted face. Right arm made from wooden spoon, left arm missing. Condition: very good. Size: 20" tall. Wooden elephant with dimensional ears, hooda with art deco design and bone tusks. Mark on bottom: BF 12/15/27. Condition: very good. Size: 21" W x 16" tall. Vividly colored wooden folk art birds on tree. Condition: excellent. Size: 26" tall. Made of wood. Depicts African American figure holding a balancing beam on pedestal with multicolored paint. Condition: very good to excellent. Size: 10". Cloth doll with oil painted life-like features. Wearing original handmade clothes. Condition: very good. Size: 22" tall. Includes eight figures of men, one child, a pig, a dog, and birds. Loss to shingles and minor losses to carved figures. Size: 19" x 21 - 1/2"
Ornate Victorian handpainted folk art mirror. Condition: excellent. Size: 45" x 32". One of the White Fleet ships Teddy Roosevelt sailed around the world after the Spanish American War. Glass case included. Excellent condition. Size: 25" x 39". Painted scene reminescent of early 1900s postcard art. All original with unreadable paper label. Condition: very good to excellent. Size: 36" long. Open wagon with three people and two horses. Marked "Baine" on the wooden platform. Nice detail. Condition: Very good to excellent. Size: 26" long.